Body Transformation: Fat Loss Freedom! Javier seized an opportunity to cut fat and get shredded. He lost 79 pounds and used his body as an introduction to exercise physiology! I never felt comfortable in my body. I wore hoodies everywhere and wouldn't dare wear a thin T-shirt out in public. At the start of my senior year, I had family issues that forced me to make drastic changes in my life. I lived more than an hour from my high school and friends, so I had plenty of time to myself. I wanted to change my appearance and took this opportunity to start my transformation. I planned to attend the University of Miami the following year and wanted to look my best. 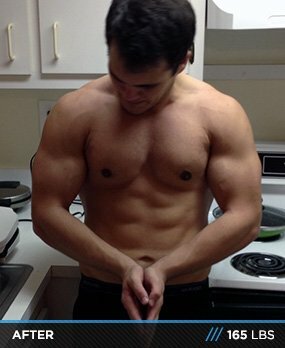 I counted macros to the best of my abilities and learned many methods that helped ease the process from Matt Ogus (LOA) on YouTube. It took at least month before I was consistent enough to find my maintenance levels. After a few months of counting macros and eating as much "Bro" food as possible, the weight started coming off. I exercised 4-5 times per week and went as heavy as possible with a balanced diet and lost more than 20 pounds. 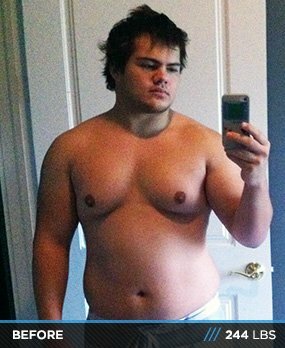 I stayed with my routine for 3-4 months, decided to add cardio, and lost another 20 pounds. The process I created for my body worked, and then I learned about flexible dieting. I started to incorporate my favorite foods back into my diet and the rest became a blur. A year later, after I lost 1.25 pounds per week, I weighed 165 pounds and finally took a moment to realize how far I came. If you want it bad enough, you'll make it happen; none of that "I'll start next Monday" crap. The aspect that challenged me most was getting back on my routine when I fell off. I failed my diet more than 20 times, but I never quit, which made the difference in the end. Dieting got easier after a little adjusting. I'm now working on a bachelor's degree in exercise physiology at the University of Miami. If not for this past year, I wouldn't have chosen this as my major. I actually switched from business school when I started. When I get my degree, I'll go from there. If you want it bad enough, you'll make it happen; none of that "I'll start next Monday" crap. Start today. Every decision you make must be in favor of your goals. I used the Bodybuilding.com app for new workouts for different body parts. Tracking my progress for others to see motivates me. I purchase my supplements from Bodybuilding.com. "Composure" by "August Burns Red"